It's Academy Awards season again, but we should really start referring to it as "Biopic Season". It seems that every year, we get more and more high-profile movies which are telling the story of a real-life person. Look at this year's crop, the major categories hold nine movies which are directly or loosely based on real-life events or people. (I won't get started on my rant that the focus on these movies diminishes support of actual fiction films which show true imagination.) Given its obsession with biopics, it's not surprising that Hollywood has now turned the lens on itself with Trumbo, a film which focuses on how the "Red Scare" took over Tinseltown. In 1947, Dalton Trumbo (Bryan Cranston) was one of the film industries hottest screenwriters. He lived on a farm with his wife, Cleo (Diane Lane) and their three children, and he rubbed elbows with big stars like Edward G. Robinson (Michael Stuhlbarg) and studio heads like Louis B. Mayer (Richard Portnow). Trumbo was a strong believer in fair labor laws and wealth equality, so he was a member of the Communist Party. Due to the Cold War and the new distrust of Russia, this affiliation cast Trumbo in a bad light, as member of the Party were feared to be spies. After going toe-to-toe with John Wayne (David James Elliot) and his "Motion Picture Alliance for the Preservation of American Ideals", Trumbo and many of his fellow writers are called before congress to testify as to their political ideals. This leads to a series of events which causes this group of writers to get "blacklisted", where no one will hire them. As screenwriting is the one thing which he's good at, Trumbo devises a scheme which will allow him and his friends to further their careers. I'm not ashamed to admit that I (like many others) was familiar with Dalton Trumbo only because footage from the film Johnny Got His Gun, (directed by Trumbo and based on his novel of the same name) was used by Metallica for the music video for their song "One". Based on the video, I tracked down the movie and was impressed by it. 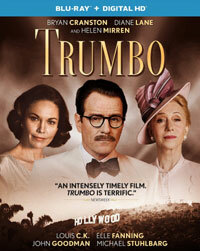 I had no idea that Dalton Trumbo had not only such an extensive filmography, but a sensational life as well. The film doesn't give us an extensive background on Trumbo's career (we see various posters, but my guess is the titles will be meaningless to most modern-day viewers), but we do see that the man is enjoying the spoils of success. But, he is also a conundrum to his friends -- he's rich, but he joins the set-builders on the picket lines. Trumbo was a true believer in equitable pay. We also see that he's not afraid to be open with his beliefs. Unfortunately for him and his cohorts, believing in communist ideas and being a full-blown Russian citizen became blurred in the eyes of many in the worlds of entertainment and politics, and Trumbo had to pay a steep price for sticking to his ideals. Trumbo comes from Austin Powers and Meet the Parents director Jay Roach, who is taking his first crack at something truly serious here. While the movie portrays a man who isn't afraid to be labeled a rebel, Roach sticks to the middle of the road here, telling the story in chronological order and never getting too arty. He allows the script to unfold at a leisurely pace and wisely relies on his great cast to carry the movie. Cranston, who is up for an Oscar for his role, loses himself in Trumbo, taking on the man's strange gait and his penchant for chain-smoking. He's in nearly every scene in the film and truly sells it. As with most films of this nature, the only true problem with Trumbo is that we, the audience, don't know what is 100% real and where the writers took dramatic license. Did Trumbo really stand up to John Wayne? If so, that is awesome. Other than telling a good story, why is this film relevant today? No one has hunted communists in America for years, right? No, but there are many others in our society today who are being singled-out, shunned, scape-goated, deported, and killed for their beliefs, religion, or skin-color. While Trumbo may have gotten off easy compared to some, the film serves as a strong-reminder of what can happen when paranoia and prejudice take over. Trumbo and his friends were wealthy and successful and that didn't stop a very vocal group from destroying their lives. Trumbo makes one wonder if "gorilla suit" could be considered an entire genre of movie on Blu-ray Disc courtesy of Universal Studios Home Entertainment. The film has been letterboxed at 1.85:1 and the Disc contains an AVC 1080p HD transfer which runs at an average of 34 Mbps. The image is very sharp and clear, showing no overt grain and no defects from the source materials (save for the newsreel footage). The film is dominated by dark, brown tones, so the splashes of color look very good and the image is never overly dark or bright. The level of detail is notable and the depth works very well here. The Disc carries a DTS-HD Master Audio 5.1 track which runs at 48 kHz and an average of 3.8 Mbps. The track provides clear dialogue and sound effects. Being a drama, we don't get a lot of truly mind-blowing audio effects here. The dialogue is always intelligible, while the music fills the speakers. A few select scenes provide proof that stereo and surround sound effects are at play. The Trumbo Blu-ray Disc contains only two extra features. "Who is Trumbo?" (4 minutes) is a brief EPK-like piece which gives an overview of the characters and the story. We get a very brief clip of the real Trumbo, as well as comments from the cast and creative team, and a quick note from the real Nikola Trumbo. This also contains a lot of clips. "Bryan Cranston Becomes Trump" (2 minutes) plays like a commercial and just give a vague overview of the story.